On the wave of Madison’s new baseball stadium (opening in 2020! ), we welecomed Mr. Roger Wexelberg, the President of North Alabama Baseball as our guest speaker. Mr. Wexelberg is a 25-year veteran in professional sports, including stints as General Manager for three minor league teams. He started as President of the Southern League baseball franchise that will relocate to Madison, Alabama for the 2020 season in July 2018. 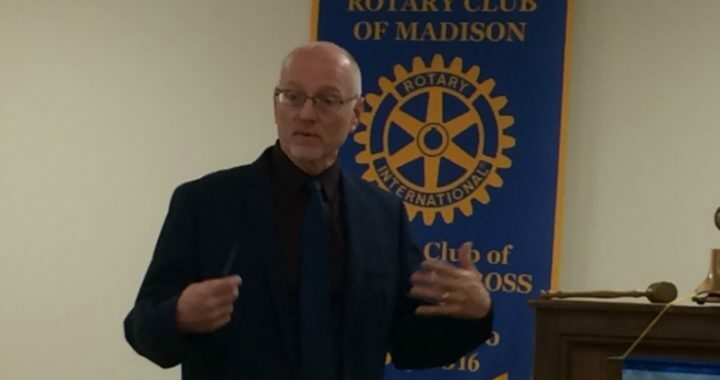 Madison is looking forward to the new stadium, the new team, and honored to have Mr. Wexelberg as our guest speaker. Read more below for his amazing sports background. Wexelberg began his career in Minor League Baseball in 1984 with the Oklahoma City 89ers, where he spent seven seasons, before moving to the Fort Myers Miracle, and later the Orlando Cubs, serving four seasons for each team as General Manager. From 2001-2010 he was either General Manager, President or part owner of the Gary South Shore Rail Cats, one of the most successful independent minor league teams in the country. While in Gary he was named Northern League Executive of the year in 2005 and lead the franchise as Northern League Organization of the year in 2006. He also spent time as the President/General Manager of the Arena Football League’s Chicago Rush and Vice President of Development of Lakeshore Public Media which operates a public television and a radio station in Northwest Indiana. Since 2015, Wexelberg worked for Learfield, the leading multi-media rights holder in College Athletics, most recently as General Manager of Bradley Sports Properties at Bradley University in Peoria, Illinois.